Yep, this is a thing. That’s why you should always double click on the work, and THEN drag to select a section before bolding or italicizing. The program will automatically select just the text, and not the space after the text. And it will do it consistently, unlike a human dragging to select text. For paragraph styles, do NOT select anything. Just place the cursor in the paragraph (or heading) and use the Styles drop down to select the proper style. This works in Word, Google Docs, Scrivener, and LIbreOffice/OpenOffice. Indeed. My method in Word is to NEVER change formatting through anything but Styles. Treat the type face, size, bold, italic, and underline attributes on the Home ribbon as read-only. This has the added benefit of enabling instant and consistent style changes through an entire text. Decide you prefer underlining to bolding for your “strong” style? Modify the “strong” style and consistently change bold to underline through a 100,000 word text in seconds instead of hours of inaccurate tedium. Or, you know, instead of the hours of inaccurate tedium, you could do a search-and-replace on text attributes. To use your example, to change all the bold text in a document to underlined text is trivially simple in Word. Agree! I’ll even take it further into the weeds. Using styles is less troublesome because it separates the physical manifestation of the style from the abstract notion of the style. I often use a separate style for temporary inline notes, which I put in italics. I also use italics for book title style. If I used search and replace to change italics to underlines, it would change both my notes and book titles, which is probably not my intent. Using styles makes it much easier if you have to put on a book designer hat. In Word, there is an option (File->Options->Display->Show all formatting) that is similar to the WordPerfect “reveal codes” that I sometimes use when the formatting gets confusing, usually around anchors, new-lines, and page breaks. WordPerfect. Yes, it is still a thing, with a modern version readily available, with that sweet, sweet “reveal codes” function. Leaving a Like or Thumbs up. Not if you did something else in between that you don’t want to undo. My old 1986 DOS text editor runs in a DOS emulator in Linux; when I need to edit a file larger than it can handle I use vi. 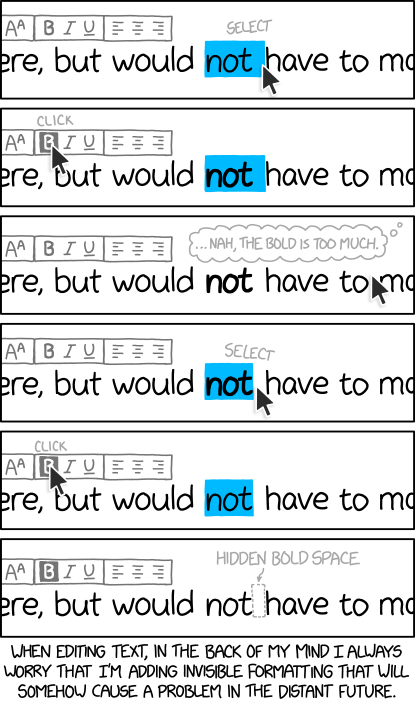 This may be too late for any use, but MS Word has a show/hide button that even the little dots for each space show differently if they are bold or italic. For something totally messed up, I’ve been know to drop it into notepad, then copy that into a new document – the hard way, but sometimes the only way to be sure you got all of the hidden bits. There’s also Wordpad. I found it is really good for cleaning up formatted text from extraneous sources. I use it with OCR’ed documents I scan. OmniSCAN and Abby both do weird things from time to time but Wordpad reduces the doc to its most basic form. Then I feed it to word and start styling.